The digital era is upon us, and some studios don't seem ready for it yet. Viacom CEO Philippe Dauman gets points for trying, but is it too late? What: Shares of Viacom (NASDAQ:VIA) (NASDAQ:VIAB) fell hard in Tuesday's morning session. Non-voting Class B shares under the VIAB ticker fell as much as 14.8% before making a slight recovery, and the voting Class A stock dropped 13.9% at worst. Viacom reported first-quarter results in the early premarket hours, and the quarter fell short in many ways. So what: In the first quarter, Viacom's revenues fell 6% year over year to $3.15 billion. Adjusted earnings swooned 9% to $1.18 per diluted share. Currency exchange headwinds played a role but a small one -- management saw the bottom line take a $0.02 hit per share from the strong dollar. Earnings were in line with Wall Street's estimates, though sales came in a bit low. The company didn't offer any guidance targets for this quarter, but you could almost sense CEO Philippe Dauman's frustration right through the text of the press release. 2015 was a challenging year operationally as we redesigned ourselves and adapted to significant industry disruption," Dauman conceded before putting a more positive spin on the news. "Our revitalized organization and our investments in content, technology and strategic innovation are now beginning to bear fruit. Although our industry continues to face headwinds, we expect our positive momentum to continue and build throughout the year. Now what: I'm sorry, but I can't see the positive momentum Dauman was talking about. 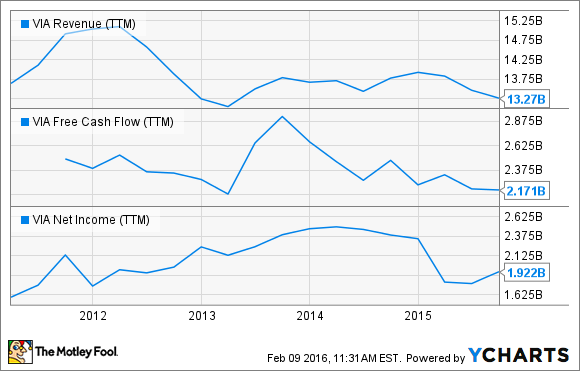 Earnings, cash flows, and sales are all down over the last five years. Business is weak in both the movie division and the TV broadcasting segment. Of course, the ups and downs of cinematic box office gold will always be lumpy, but TV operations are supposed to provide a stable and inexorably rising operating platform. And that is not happening. VIA Revenue (TTM) data by YCharts. Now, Dauman is trying to do something about this conundrum. Selling Viacom's content on digital platforms is the wave of the future, and they are indeed working on that. Just this morning, for example, the company also announced an expanded partnership with social media maven Snapchat. That's a snappy start, but is Snapchat big enough to drive Viacom's content sales in the long run? Somehow, I doubt it. Viacom's shares have now fallen more than 40% over the last year (yes, both of them), making the Nickelodeon and Paramount parent a worst-of-breed performer in a broadly suffering sector. Other than Walt Disney (NYSE:DIS), it's hard to find a filmed content studio that has beaten the market over the last 52 weeks -- and even the House of Mouse is only doing it by the skin of its rodent teeth. The whole industry needs to get a grip on the emerging digital market before it slips through their fingers. That includes Viacom in a big way.